Injuries from overexertion are a leading cause of workers’ compensation claims for contractors, which isn’t surprising given that many of the most common job tasks involve lifting, stooping, kneeling, twisting, reaching overhead and working in awkward positions. Over time, these motions can cause long-lasting health issues such as tendinitis, rotator cuff tears, sprains, strains and back problems. You may not be able to remove all the physically demanding tasks from your team’s to-do list, but you can make small changes to work methods and equipment that can have a big payoff in terms of safety, efficiency, productivity and employee turnover. Whenever possible, incorporate prefabrication and preassembly into your projects with elements like prepoured slabs, modular wall and frame pieces, and HVAC or plumbing assemblies. Building these items in a shop before transporting to the jobsite allows the work to be completed in an environment better-suited to the work, which makes the final product faster and safer. This process reduces the amount of lifting, stooping, reaching and carrying for the onsite workers doing the installation, and creates an overall lower risk of injury. Preassembly does require additional planning and coordination, but the payoff can be significant in terms of cost savings as well as safety. In fact, a study from the National Institute of Standards and Technology(NIST) found that prefabrication can reduce a project schedule by four weeks or more and reduce project budgets by 6% or more. Getting employees closer to the task at hand reduces awkward postures—such as bending over or working with arms overhead—that cause discomfort, fatigue and injury. Aerial lifts or ladders can elevate an employee to be closer to the work area, or employees can bring the work to them with adjustable height work benches (or even a stack of pallets). Instead of kneeling on the floor to assemble sheet metal ducts or build rebar cages, raise the work to waist height with tables or sawhorses. If the work can’t be moved closer to the employee, look for tools that allow the worker to complete the task with less strain and in less time from a distance. Tools with extension handles can be quite handy for floor-based tasks such as tying rebar, screeding concrete or fastening sub-flooring. Likewise, extensions are available for ceiling- or wall-based tasks such as drilling overhead or finishing drywall. Repeating the same body motions over and over again is an invitation for injury. Do you have any job tasks that require the same motion to be repeated over and over for more than an hour a day? See if the task can be simplified to eliminate the repetition, or if it can be automated so that a machine or battery-powered tool takes the brunt of the repeated motions. Look for tools and equipment that minimize the amount of force required to accomplish a task. Hydraulic tools, for example, require much less hand force from employees. Power tools are even available for tasks such as caulking, cutting cables and pulling wires. Non-powered hand tools, when selected thoughtfully, can also reduce strain on workers. When purchasing new tools, compare the effectiveness of new designs versus traditional styles and choose a tool that’s the right size and shape for the task and the user. Tools are also easier to use when they’re kept in good condition, so keep them oiled, sharpened or otherwise maintained. If workers don’t have the right tool for the job, they’ll be tempted to improvise. Don’t let employees use their bodies as tools – for example, using the heel of the hand instead of mallet. Whenever possible, use material handling equipment (e.g., carts, dollies and lift gates) to lift and move heavy or awkward items. If that’s not possible, use two people for a team lift. Material handling help is available for bigger lifting jobs, too. Wall jacks can help lift partitions into place and motorized lifts can transport building materials like plywood and masonry. 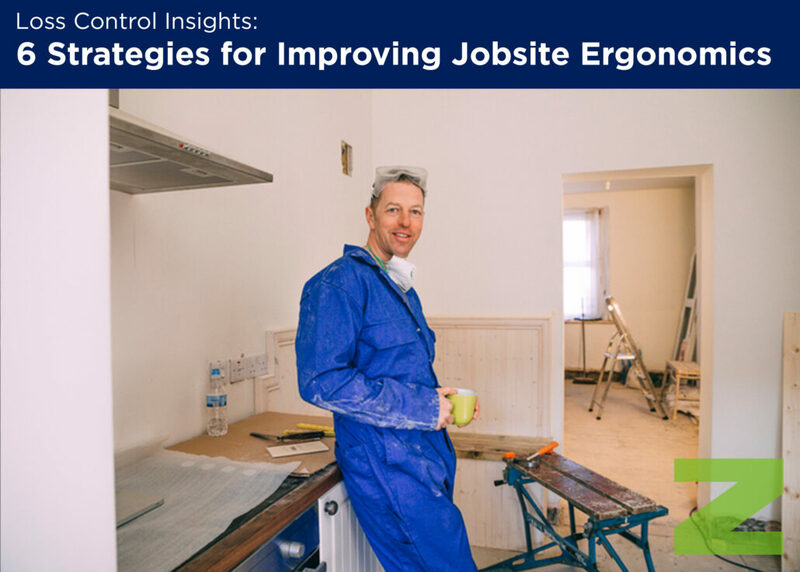 You can also reduce ergonomic hazards from the project outset by ensuring designers specify lightweight concrete block whenever it’s structurally feasible and using pre-blended mortar and grout bulk delivery systems.